Reactor Resources (RxR) is a leading supplier of sulfur chemicals and sulfiding injection services for refinery and petrochemical applications. RxR was formed in 2011 with the goal of establishing a new standard in catalyst sulfiding. 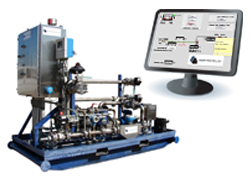 Reactor Resources provides our chemical injection and gas monitoring services to refineries throughout North America, Europe, and the Middle East. Our home office is located south of Houston, Texas in the city of Alvin. In October, 2018, we acquired Actisulf SAS in Tarbes, France. This acquisition expands our capabilities to service customers in Europe and the Middle East. We also have a European Office in Rotterdam, The Netherlands. RxR has now sulfided over 500 hydrotreating and hydrocracking units (including +200 by ActiSulf). We provide turn-key sulfiding services including the supply and delivery of the sulfur chemistry, rental of injection equipment and gas analyzers, and fully trained technicians to set up and operate the equipment 24/7. Our innovations, such as Cloud-based Telemetry and Online Gas Analysis, have become standard operating procedures at almost all of our client's facilities. We are the only sulfiding company that offers both Dimethyl Disulfide (DMDS) and di-Tertiary Butyl Polysulfide (TBPS 454) for catalyst sulfiding, uniquely qualifying us to assist you when deciding the best chemical for your sulfiding project. Reactor Resources is also a leading supplier of Dimethyl Sulfide (DMS) and Dimethyl Disulfide (DMDS) to ethylene steam crackers for the passivation of furnace tubes. RxR has technical experts in the area of ethylene sulfur injection that can support you with optimization of your DMS or DMDS injection. Our Performance Products Division supplies specially blended compressor wash oils to ethylene facilities to keep compressors operating at peak efficiency. Our technical experts can aid you in the selection of the best wash oil for your application. Please don't hesitate contact us for more information on any of our products or services. We are passionate about serving our customers and are anxious to help you. Reactor Resources supplies Dimethyl Disulfide (DMDS), Dimethyl Sulfide (DMS), and Tertiary Butyl Poly-Sulfide (TBPS). Copyright © 2018 Reactor Resources, All Rights Reserved.